100 Snacks to send and share a box of fun. Great Easter basket gift! Awesome variety, that's perfect for the dorm. Everything is fresh, and carefully selected, hand packed snacks in our special gift box. An easy way to please everyone at the office, there is something for everyone. 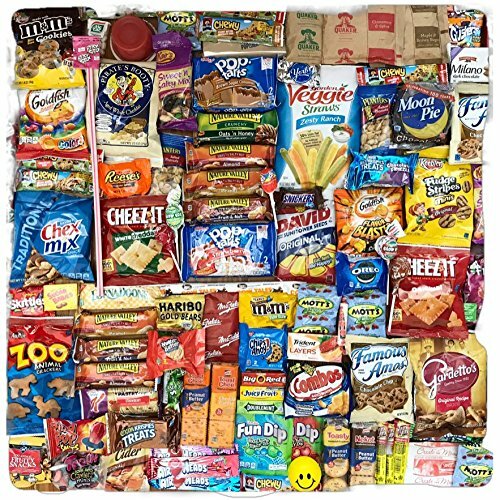 A fun variety of Quaker Oats Bars, Nature Valley Bars, Veggie Straws, Fruit & Nut, Oats and Honey, Chewy Bars, Chips, Cheez its, Veggie Straws, Candy, Gummies, Crackers, Nutri Grain, Fruit Roll ups, Pretzels, Nuts, Trail Mix, Cookies, Oatmeal, Popcorn, Fun Dip, Pop Tarts, Fig Bars, Gummy candies, Peanut Butter, Peanuts, Cookies, Peanut Butter cookies, Chewing gum, Cheddar Crackers, Air Heads, Slim Jims, and of course our signature stress ball! Squeeze away the stress with a smiley ball. We are care about every single customer. Our campaign #sharethatsmile is what we strive for each and everyday. 9 Pounds of Deliciousness! Share that smile over 100 VARIETY of SNACKS Assortment of Individually Wrapped Single Serve Snacks delivered right to your door. Sweet, salty, spicy, it's in there! So much food to feed the family, team, office or to have options for lunch boxes. You get over 100 snacks For example, we count a 2 count pop tart as 1...the other guys don;t care as much as we do. EVERYONE LOVES SNACKS: The Perfect Gift that keeps on giving for Friends, Family, Office, Dorm Students, College, Dorm, Military, Get Well, Thank you, just about anyone. SWEET and SALTY: Huge Variety Snack packs all Quality & Quantity and hand packed from us in our sweet little town from Georgia. If you have any questions about this product by SmallTown Table, contact us by completing and submitting the form below. If you are looking for a specif part number, please include it with your message.